On first impressions the pub is very warm and welcoming. 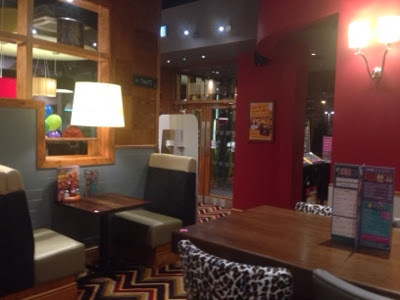 It is deceptively spacious with a selection of seating areas from large booths with their own private tv to small bar tables with stools for 2. There is a separate bar area reserved for over 18's only (and from what I could see of the bar it was very well stocked with a wide selection) The bar area would be fab place to meet for pre-cinema drinks. As with most (or all?) Hungry Horse pubs, the pub has been designed with the location being taken into account. 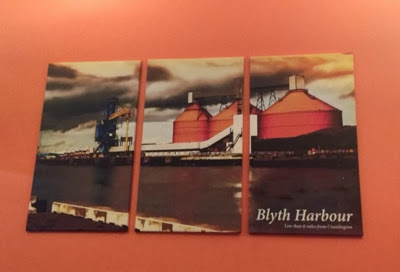 I loved this photograph of Blyth harbour next to our seats. We were given a prime table with our own tv. 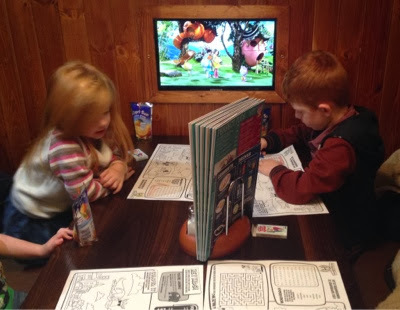 Kids thought it was great watching Cbeebies while we waited for our food. I'm sure Sky Sports news will be the channel of choice in these booths over weekends! 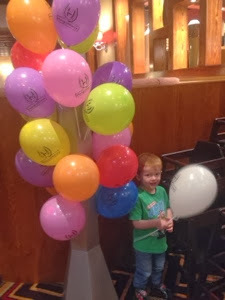 The children were given a colouring/puzzle sheet and packs of crayons and told they could choose their own balloon from the balloon tower on their way out (this was a great bribe to use when they showed signs of mis-behaving). The main menu is large and full of deals. The two meals for £8.49 and curry club deal particularly caught my eye. We spotted a few fellow diners enjoying curries and they looked and smelled delicious - not like your usual pub curry. We will definitely try one next time we visit. £5.50 for a curry and a pint is fantastic value. There is a strong emphasis on 'sharing' throughout the menu which I personally love. It is an informal way of enjoying food with the kids and you can usually get them to try something they wouldn't normally try. 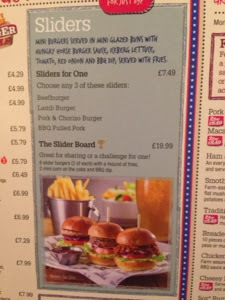 The 'Slider board' looks fantastic and would be great to order and share amongst a group of friends (8 slider burgers - 2 each of beef burger, lamb burger, pork and chirizo burger and BBQ pulled pork burger, plus mini corn on the cobs and a mound of fries - £19.99). There certainly is a lot to choose from. 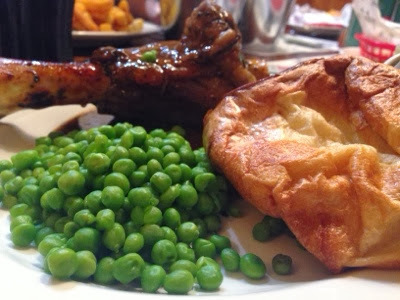 I settled for the slow cooked lamb shank which was served with a HOMEMADE Yorkshire pudding (delicious), peas and mash. At £8.99 this was very good value for money and it was great to have a homemade yorkshire rather than a bland frozen one. Hubby was hungry and ordered the full Monty mixed grill which consisted of a 5oz rump steak, 5oz gammon steak, pork sausage and a farm-assured roasted chicken breast topped with a free-range fried egg and grilled pineapple ring. 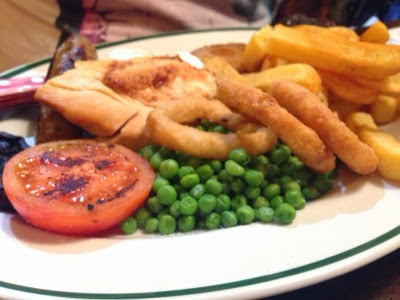 Served with chips, peas, onion rings, a flat mushroom and grilled tomato. Phew! At £9.79 this was again fantastic value. We asked for the steak to be served medium-rare and that's how it arrived so brownie points for that! 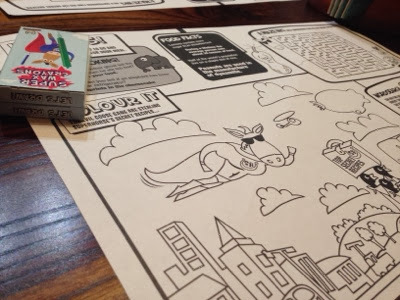 The kids menu is simple. 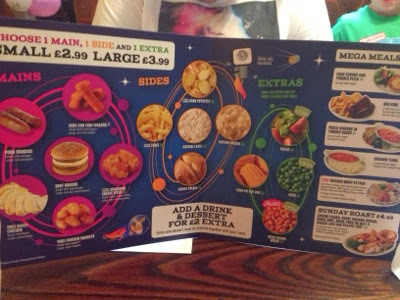 You can order a small meal for £2.99 or large for £3.99 then add a drink and dessert for £2. All of my children love chicken nuggets and chips and always tend to order these when we eat in a pub. 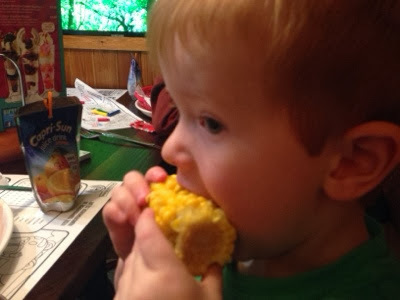 You can choose your own sides and I'm pleased that corn on the cob is an option as it's a favourite of ours. 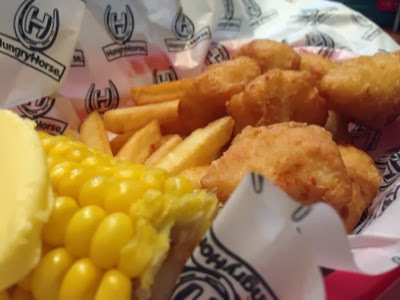 The chicken nuggets were very good quality and seemed to be homemade. I would (and did!) eat them myself which is always a good sign. We ended up with 3 clean plates. The children enjoyed chocolate ice cream for dessert and we didn't want to miss out. 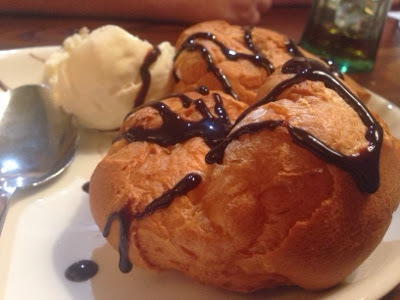 We ordered the giant profiteroles (£4.39). I was expecting a giant tower of profiteroles but when it arrived it was actually two giant profiteroles! They were lovely but next time I think I will try the 'desserts your way' How fab being able to design your own dessert! If I receive bad service it will take a lot for me to return somewhere, even if the food is fantastic. In my book bad service just really ruins a night out! I'm pleased to say that this was not the case at the Seven Oaks. It is clear that they have a rigorous recruitment programme and have invested time in training their staff. Everybody was friendly, helpful and going out of their way to make sure we were having a good time. A special mention to Alexis on the bar who served us. We were her first customer but she still managed to make us feel like nothing was a problem and took the time to ask us about our evening in a genuinely interested way. Service like this really does make the difference to whether or not you choose to go back somewhere and is great to experience. We all really enjoyed our evening and left discussing when we will can go back. Our seven year old said it was 'really tasty' and our four year old said it was 'very yummy'. If they're happy, I'm happy! 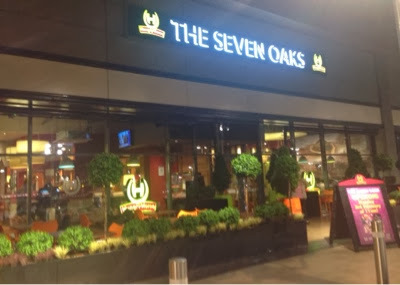 The Seven Oaks opens in Cramlington (near the Vue cinema) on Monday 3rd February at 11am. 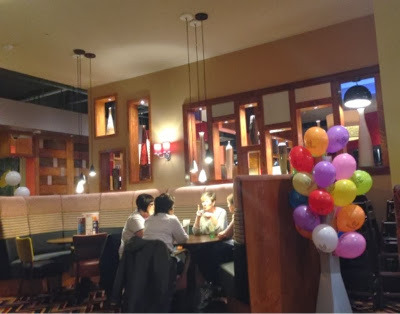 We attended during a pre-opening evening and received a complimentary meal . We were not obliged to write this blog post. All thoughts are our own.